After you have found the resources that you want to tag, you can add, remove, and edit the tags for some or all of your search results. Tag Editor shows you any tags that have been added to resources, whether those tags were added in Tag Editor or by using the resource's service console or API. 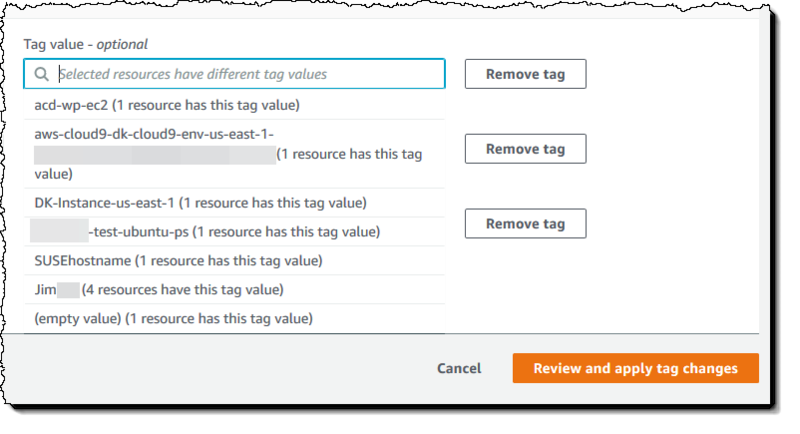 When you add, remove, or edit existing tags, you are changing tags only on those resources that you select in of the results of your Find resources to tag query. You can select up to 500 resources on which to manage tags. You can use Tag Editor to add tags to selected resources that are in the results of your Find resources to tag query. In the results of your Find resources to tag query, select the check boxes next to the resources you want to add tags to. Enter a text string in Filter resources to filter for part of a resource's name, ID, tag keys, or tag values. In the Tags column, note that resources in the results already have tags applied to them. In the following example, the first selected EC2 instance already has two tags. Choose Manage tags of the selected resources. On the Manage tags page, view the tags on the resources that you selected. Although your original query returned more resources, note that you are adding tags only to the resources that you selected in step 1. Choose Add tag. Enter a tag key and an optional tag value. In this walkthrough, we add the tag key Team and the tag value Development. A resource can have a maximum of 50 user-applied tags. You might not be able to add new tags to a resource if you are approaching 50 user-applied tags. Typically, read-only system tags do not apply to the 50-tag limit. Tag keys must also be unique within your selected resources. You cannot add a new tag with a key that matches an existing tag key in your selected resources. When you are finished adding tags, choose Review and apply changes. If you accept the changes, choose Apply changes to all selected. Depending on the number of resources you selected, applying new tags can take a few minutes. Do not leave the page or open a different page in the same browser tab. If changes were successful, a green success banner is displayed at the top of the page. Wait for a success or failure banner to appear on the page before you continue. If tag changes to some or all resources were not successful, see Troubleshooting Tag Changes. 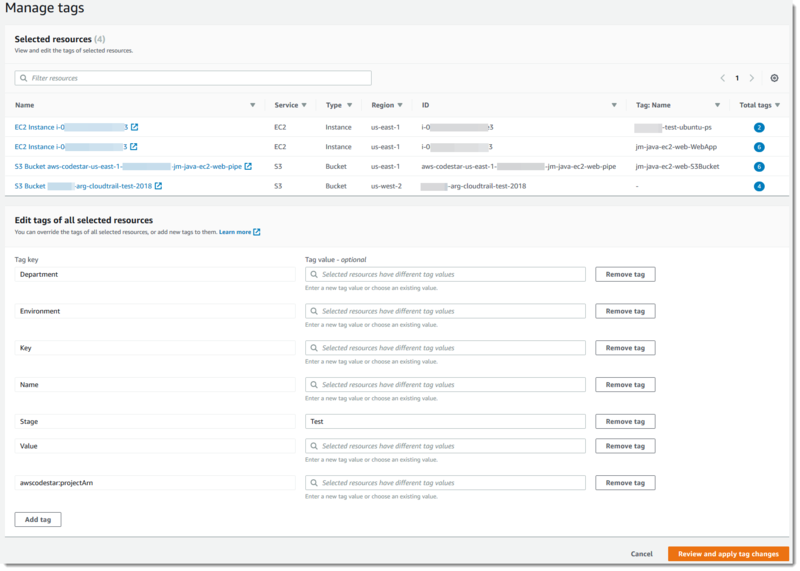 After you troubleshoot and resolve the root causes of unsuccessful tag changes (such as insufficient permissions), you can retry tag changes on resources for which tag changes failed. For more information, see Retry Failed Tag Changes. You can use Tag Editor to change existing tag values on selected resources that are in the results of your Find resources to tag query. Editing a tag changes the tag's value on all selected resources that have the same tag key. You cannot edit a tag key, but you can delete a tag and create a new tag to replace a tag key. This deletes all tags with that key on selected resources. In the results of your Find resources to tag query, select the check boxes next to the resources for which you want to change existing tags. Enter a text string in Filter resources to filter for part of a resource's name or ID. In the Tags column, note that resources in the results already have tags applied to them. In the following example, the first selected EC2 instance already has two tags. On the Manage tags page, in Edit tags of selected resources, view the tags on the resource that you selected. Although your original query returned more resources, note that you are changing tags only on the resources that you selected in step 1. Change, add, or delete tag values. Existing tags must have a tag key, but tag values are optional. In this walkthrough, we change the value of the Team tag to QA. Selected resources have different tag values is displayed in the tag value field if resources in your selection have different values for the same key. In this case, placing your cursor in the box opens a drop-down list of all available values for this tag key in your selected resources. If resources in your selection have the tag value you want, the tag value is highlighted as you type it. For example, if resources in your selection already have the tag value QA, the value is highlighted as you type Q. The values in the drop-down list help keep tag values consistent across resources. The tag value is changed on all selected resources. In this example, the tag value is changed to QA for all selected resources that had a Team tag key. For selected resources that did not have the Team tag, the Team tag with the value QA is added. When you are finished changing tags, choose Review and apply changes. Depending on the number of resources you selected, editing tags can take a few minutes. Do not leave the page or open a different page in the same browser tab. If changes were successful, a green success banner is displayed at the top of the page. Wait for a success or failure banner to appear on the page before you continue. You can use Tag Editor to remove tags from selected resources that are in the results of your Find resources to tag query. Removing a tag deletes the tag from all selected resources that have the tag. Because you cannot edit tag keys, you can remove tags and replace them with new tags if you need to edit a tag key. This deletes all tags with that key on selected resources. In the results of your Find resources to tag query, select the check boxes next to the resources you want to remove tags from. Enter a text string in Filter resources to filter for part of a resource's name or ID. On the Manage tags page, in Edit tags of selected resources, view the tags on the resources that you selected. Although your original query returned more resources, note that you are changing tags only on the resources that you selected in step 1. Choose Remove tag next to any tags that you want to delete. In this walkthrough, we remove the Team tag. Choosing Remove tag removes a tag from all selected resources that have the tag. In the example shown, this removes the Team tag from all selected resources that currently have the Team tag, regardless of the tag's value. Choose Review and apply changes. Choose Apply changes to all selected. Depending on the number of resources you selected, removing tags can take a few minutes. Do not leave the page or open a different page in the same browser tab. If changes were successful, a green success banner is displayed at the top of the page. Wait for a success or failure banner to appear on the page before you continue. If tag changes fail on at least one of your selected resources, Tag Editor displays a red banner at the bottom of the page. The banner shows error messages for each type of failure that occurred. For each error, the banner identifies the specific resources on which Tag Editor could not make tag changes. After you review and troubleshoot the errors, choose Retry failed tag changes on resources to retry changes only on those resources on which tag changes failed.